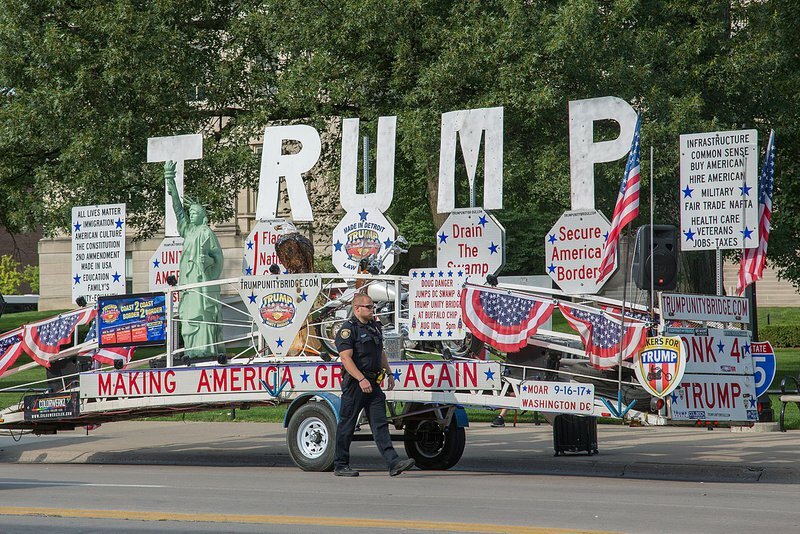 The ‘Trump Unity Bridge’ trailer on August 18, 2017 in Iowa City, Iowa. Credit: Tony Webster via Wikimedia Commons. CC BY-SA 2.0. In 2017 Donald Trump posted a clip of himself on Twitter wrestling an avatar of CNN to the ground. In the thirty-second vignette he seizes an individual with CNN’s logo where the head should be and pummels them. The point was to position himself as a defender of truth, flattening media enemies who spread disinformation about his reign. It was a predictable move: Trump is a recurring character on World Wrestling Entertainment (WWE), body slamming its CEO Vince McMahon, “buying” its ‘Monday Night Raw’ program and remaining unperturbed by an egregiously racialised boogeyman who regularly appears in the ring. He is the only US President to be inducted as a member of the WWE Hall of Fame. His immersion in this world might appear to be just another instance of the absurdly comic combining with the brutally terrifying in his presidency, but it is much more than that: the collision between Trump and wrestling provides an insight into his tactics and the broader contemporary transformation of electoral politics. The WWE taught Trump how to fuse the interests of big business with a mass of people coagulated around shared rage. Nationalist populism is an odd phenomenon in the ways in which it creates alliances between voters who occupy structurally opposed positions. Trump has managed to combine support from the corporate world, evangelical Christians, rural southerners and ex-union Democrats in a way that confounds existing psephological models. Transcending, at least to some extent, distinctions between left and right, this alliance melds together the ultra-rich with the people they have actively disempowered. There’s an obvious inconsistency here: big capital fattens itself on the democratic choices of its victims. But this also suggests that ideology and demography no longer provide a satisfactory explanation for the results of elections. Something else brings this bloc together - mass emotion which has taken the place of ideological identification. What unites the electoral victories of nationalist populists is their ability to manipulate affect, to induct their voters into a shared mood that usually resonates in the key of anger and hate. So could ‘emotional politics’ of this kind also be used to anchor a progressive revival? The shift from ideology to emotion that has taken place in politics over the past 30 years passed through a phase of centrism in the 1990s when liberal democracy was seen as the ‘end of history.’ Dominated by a managerial technocracy, the role of politicians was to oversee public affairs in a rational, detached manner in an affectless world. Neither the governments they ran nor the people they governed were expected to behave emotionally. Politics was stripped of any sense of mob mentality in order to save the populace from their supposedly self-destructive urges. This model of governance also aimed to create a new citizen who would vote similarly according to rational, calculating self-interest. Manifestoes were not statements of belief so much as collections of incentives directed at different demographics. While this might encourage voters to retreat ever further into an atomized individualism, on the up side communities would never again fall into violence or pathology. It was these pathological urges, so the thinking went, that had led to fascism earlier in the century. Mass displays of orchestrated emotion characterized fascist governments and led whole populations to run willingly towards their own destruction. Once these regimes were defeated, ‘the people’ awoke, self-forgetful and stunned, their spent emotions discarded all about them. Picture the scene: Donald Trump, eerie and disembodied on a giant raised TV screen, addressing an audience of enthusiastic wrestling fans. He rails against McMahon and pretends to advance the cause of an increasingly agitated audience against this vast media conglomerate. He pauses, and then releases money from the ceiling, huge wafts of dollar bills of different denominations floating down to the floor. The audience grabs and grasps at what they can. It is an exemplary moment, as prescient as it is troubling for how it anticipates Trump’s electoral tactics. In this knowingly theatrical moment he transforms his vast wealth into a mass spectacle that unifies the crowd into a seething mood of collective affect. Trickle-down economics, one of the great shams of neo-liberalism, becomes material for entertainment, literally and metaphorically. The audience experiences emotion at its most visceral and unrefined, and crucially, recognizes the same affect in others. This transformation of entrenched financial power into cod drama that elicits an intense, shared response is characteristic of Trump’s appearances on WWE, and, to a lesser extent, on his own TV series The Apprentice. In each case, Trump is able to make big money and big emotion equivalent to each other, and to use business as a tapestry for negative manifestations of group emotion. The entrenched financial power of oligarchs transmutes into a form of spectacular entertainment that unearths citizens from their ideological substrata and lifts them into a shared mood of frenzy. It’s precisely this fusion that brought him to power in 2016. These actions exploit a contradiction in the liberal democracy of the previous era: while politics became increasingly technocratic, emotion was outsourced to, among other places, corporations and consumerism. To buy anything in this era was to experience a swelling of emotion, a visceral experience of selfish desire that swallowed up both need and utility. This is why branding became the preeminent business activity: in a context where function is effectively homogenous, consumer choices are driven increasingly by feeling. But these outsourced emotions could also eat up liberal democracy itself. There was always the risk that the calculated manipulation of the collective emotional world could break out into self-destructive actions. The riotous outpourings of consumer violence that mark the sales, special offers and mark-downs of ‘Black Friday’ in the US reveal just how fragile the balance can be between corporatism and mania. As businesses made emotions central to consumption, emotion and feeling became the yardstick for authenticity: if something felt good then it was. Corporatism catered for affect, and objectivity be damned. It was precisely these contradictions and intersections that Trump sensed could be useful in his campaign by redirecting emotional frenzy from products to politics. Trump’s rallies resemble the wrestling arenas in which he appears and the shopping centres that are ravaged by riots among consumers. That emotions have displaced objectivity also explains Trump’s post-fact world. In this universe it doesn’t matter whether a statement is true or false. Instead, the positive or negative feelings invoked by any given statement are taken as self-authenticating and total. The reaction of the audience is deemed legitimate regardless of the content of the stimulus that provoked it. This is exactly how the WWE also operates. The authenticity of the scene is irrelevant: it is a known sham. What is significant is the power of the mass spectacle to create a shared mood of rage, a mood that can bring together the millionaires and those they have dispossessed. A basic principle of electoral strategy is to acknowledge things as they are. This means that if the left is to reverse the rise of nationalist populism it will have to do so by generating an affective atmosphere using similar techniques of mass spectacle and participation. The emotional realm need not be divorced from policy; every ideology comes with its own mood after all. Fortunately, the left has access to a set of positive emotions that the right does not: optimism over fear, love over hate, care over callousness and tolerance over hatred. These emotions are tougher, more textured and more rewarding than the dark binaries with which they are twinned. They offer us a route to bring people together in a mood of mass hope.